Often sought, seldom found. 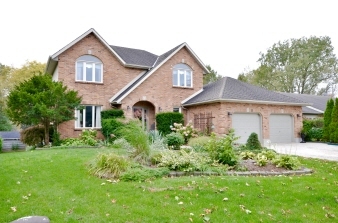 Bright & spacious red reclaimed brick 2-Story Home set on spectacular Park-like lot backing onto Conversation Area. As you enter this fine Family Home you are immediately taken by the classic staircase & trim in the front foyer. The large sun-splashed Kitchen is adorned with traditional oak cabinetry, centre island & separate Eating Area with a view of the stunning Rear Yard. Entertainment sized Family Room is open to the Kitchen & is warmed by a cozy gas fireplace. Patio doors open to a newly refurbished private wood deck. Competing the main floor is a classic Living & Dining Room high-lighted with oak floors & an entrance from the 2 car garage into the main floor Laundry Room & 2- piece Powder Room. Upstairs there are 4 sizeable Bedrooms, Master with Ensuite Bath & another Main 4-piece Bath. Lower Level features a fabulous separate Granny Suite that has an entrance direct from the garage, Includes large Living Room with patio doors to rear yard.